This section covers the period through to the final demolition of the Castle in 1928. Church figured in Aylsford picture collection without a spire, and only the tower (1). See drawing in St James Church Picture Gallery. 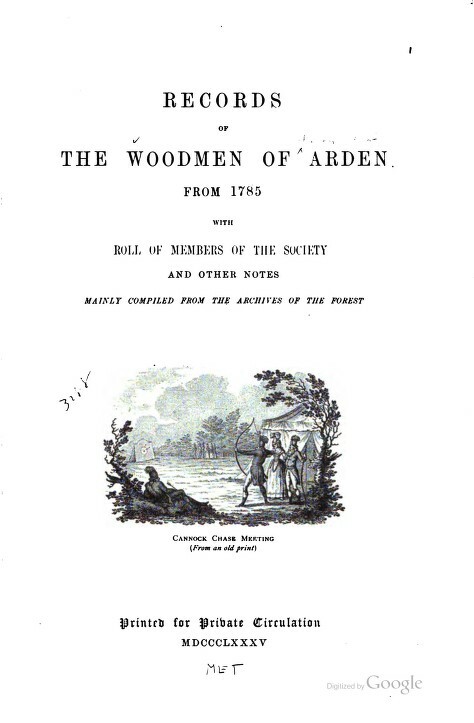 A 'Martin Leggatt' is noted as being a resident of Weddington Hall in this year (according to the book: "Records of the Woodmen of Arden from 1785" which detailed members of the historic 'Woodmen of Arden' archery club, based at nearby Meriden). 7th Aug. Auction Sale at Weddington Castle comprising furniture, library, paintings. William PULLIN (Auctioneers) (29) You can view the Auction Catalogue here. 90 Acres of woodland in Weddington (1) Rev. Samuel Bracebridge HEMING became Lord of Manor until 1856 (1). Weddington population: 74. Census: William COOPER, clerk without care of lands lived at WeddingtonCastle. KAY owned the Castle (33) - you can view the Auction Catalogue of the sale where KAY bought the Castle here. Frederick Henry KAY owner of The Castle. R. SWINNERTON at The Grove (33). Also the 1871 census makes reference to an unmarried housemaid at The Grove, aged 23, by the name of Jane White (who was born in Chilvers Coton of parents John and Susan White of Heath End). 7th Jun. Henry Arthur DEWES died, buried at Caldecote. 21st Feb. Nuneaton Chronicle: Messrs Cookes & Sons have received instructions from F.H. Kay Esq (in consequence to him having sold the Estate) To arrange for sale by auction, On Monday, Tuesday, Wednesday, Thursday Friday and Saturday the 2nd, 3rd, 4th, 5th, 6th, & 7th days of March 1874 (113). See here for details. 14th Mar. Nuneaton Chronicle: Sale advert for 2.00pm 16/3/1874 by John Sands, for ROUGH FARM. The whole of the livestock, implements etc. on the above named farm, consisting of 3 in-calf cows, 2 yearlings, 4 in-lamb ewes, 2 Tegs, 2 6-in wagons, 2 carts, turnip cutter, chaff machine, sheep and pig troughs, ladders, and greater part of the neat and useful household furniture, comprising mahogany sideboard, dressing and toilet tables, bedsteads, bedding, and a general assortment of household furniture etc. Church again restored for £1,600 by S. FOX to a plan by A. BLOOMFIELD (33) Some accounts say the whole tower was built then, this disagreed with Aylsford picture of 1820. Charles PENDRY at Gardners Cottage. Weddington population: 102. Henry C. SHAWE died and was buried in St James' churchyard. 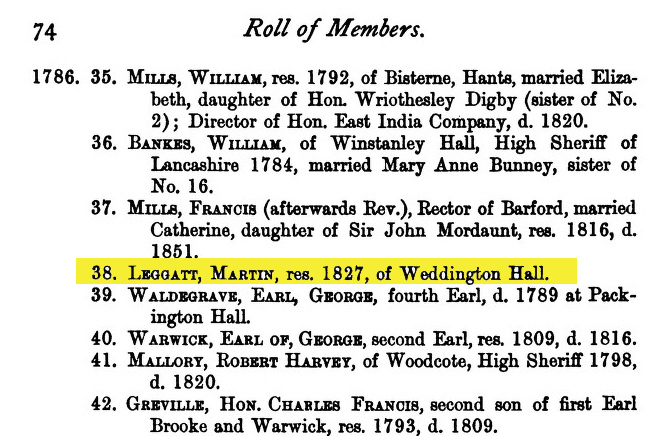 His son Henry N. Pole SHAWE inherited the estate but went to live in The Grove (33,34), although 'Kelly's 1912 Directory for Warwickshire' lists his address as Weddington Hall in that year. Records show that Captain Geoffrey J. Shakerley is resident at Weddington Hall. Read more about CaptainShakerley and see a photograph in a PDF document by clicking here. Stained Glass window to Henry Cunliffe SHAWE. 22nd September: Weddington Castle (Hall), plans published to convert it into flats and to build houses on the estate lands. Accurate details of room sizes. Library 29' x 19' polished Oak floor, marble chimney piece, etc. Eleanor Grace Wolferstan, daughter of Henry Cunliffe Shawe, died in Statfold, Staffs. 2nd January: Heavy floods at Weddington (37,94). See photo here. 19th October: Castle Demolished. It is rumoured that the rubble was used to build Castle Road on, with some possibly going to the Countess Road area according to the late Frederick Reeves. However, an alternative account (recounted by local historian Peter Lee in 2012), suggests the Castle stonework was labelled, dismantled block by block and shipped to America. Auctioneer James Styles & Whitlock. Some of the house contents are believed to be in America. The stone crest of arms was preserved in Numbers 1 and 3 Shawe Avenue. One of the terracotta lions from the entrance of the Castle turned up nearly a century later in 2011 - see here for details.